Jobs are at the centre of the eighth goal of the 2030 Sustainable Development Goals (SDGs) calling for the promotion of ‘sustained, inclusive and sustainable economic growth, full and productive employment and decent work for all’. They are also embedded in three other SDGs aiming to ‘end poverty in all its form everywhere’; to ‘achieve gender equality and empower all women and girls’, and to ‘reduce inequality within and among countries’. In line with this agenda, governments and policymakers are intent on identifying policies and programmes that increase the probability that jobless youth will find work, raise the productivity and income of the underemployed, and facilitate a transition from school to the labour market without extended delay. The Young Lives study research findings emphasise that the pathways through adolescence are highly complex and that young people’s lives are shaped by a series of major transitions. These include transitions from primary to secondary school education and leaving school, starting work, and, especially for girls, marriage and parenthood. The study is well placed to investigate the opportunities that become available for children of the Millennium tracking their trajectories when they leave education, transition to the adult life, and exploring what they go on to do next. A couple of weeks ago, Grace Chang reflected on how to appropriately define children in work in relation to our data visualization covering the incidence and types of work that Young Lives children do when growing up (click here). In this blog, I focus on the last two rounds of data collected (Round 4 in 2013 and Round 5 in 2016) from our Older Cohort children (at ages 19 and 22 years) and discuss some key findings emerging around young people’s economic participation across our study countries. This data are showcased in our newly released skills and work visualizations. 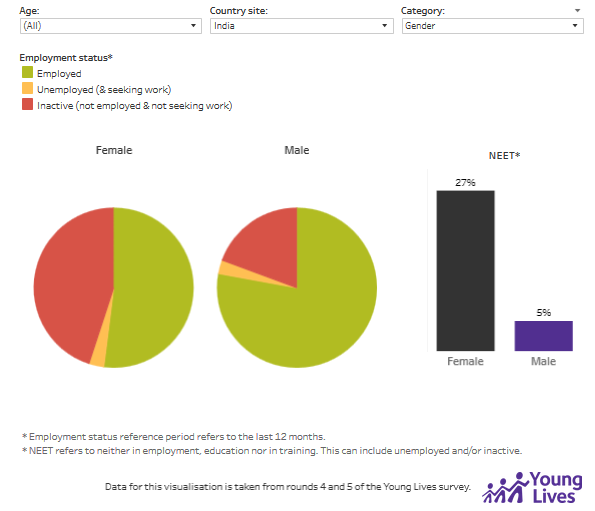 Please note that while the visuals below are static, the interactive data visualisations are available on the Young Lives website. Large numbers of children in developing countries engage in forms of work that can include chores within or outside the home, or paid and unpaid activities outside the home. 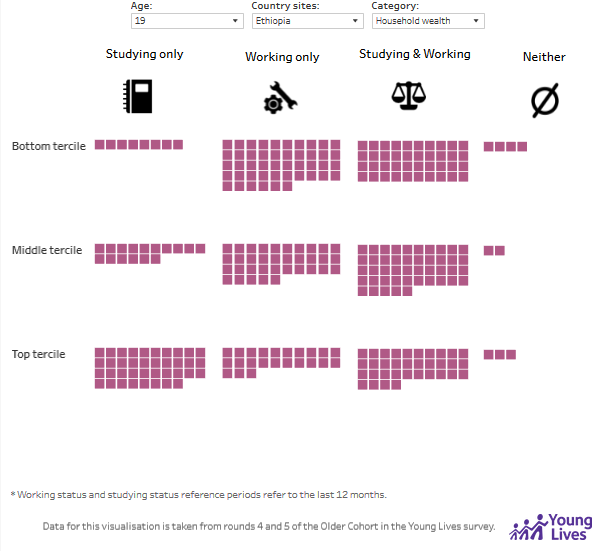 When not accounting for domestic chores and care work, about 11% of our Older Cohort children were involved in work in India, 7% in Ethiopia, 23% in Peru and 5% in Vietnam at age 12 (click here). As these children grow up, fewer end up solely in engaged in study. Nevertheless, at age 19 and 22, a significant proportion of individuals (between 23 % and 40% in India and Ethiopia respectively) continue combining formal education and working in the labour market in all countries (click here). In Ethiopia, for example, almost half (46%) of young people living in the poorest households dropped out of school and are fully engaged in economic activities by age 19. In the same country and at the same age, the reality is very different for young people who grew up in least poor families: only 23% are working only while the remaining are either studying only or combining working and studying (Figure 1). Similar patterns are found in the other study countries and can be explored here. In all countries, 19-year-old males are less likely to be studying only and more likely than females to be working (either working only or combining the two activities). The example reported below is from India, where we also noticed increasing rates of female inactivity as a result of early family formation and fertility (Figure 2). In fact, across all countries, the majority of young people are engaged in the labour market, but there are substantial variations across countries. The proportion of youth engaged in employment is highest in Vietnam (82% at age 19 and 92% at age 22) and the lowest in India (63% at age 19 and 67% at age 22, Figure 3). Conversely, and consistent with national statistics, unemployment rates are generally low (below 6%) in all countries. High levels of inactivity in India explains the relatively low labour market participation for this country. About 36% of the India sample is inactive at age 19 and 29% at age 22. There are more inactive young women compared to young men at both years, and the gap increases by age 22. Across our country sites, children were initially mainly involved in agricultural work (click here). Growing up, they tend to move out of agriculture sometimes migrating to find jobs in urban areas (click here). In fact, most young people in the four study countries have left agriculture by age 22 and are working mainly as dependent workers. The transition out of agriculture in India happens at a later stage than in the other countries: 56% of young people in India are still working in agriculture at age 19 (Figure 4). Preliminary findings from the last round of data suggest that most of the employed young people in the four study countries are involved in more than one work activity at the same time and almost 1 out of 2 work more than 48 hours per week in their main activity. Out of those who work as dependent workers, few have a written contract in Ethiopia, India and Peru. 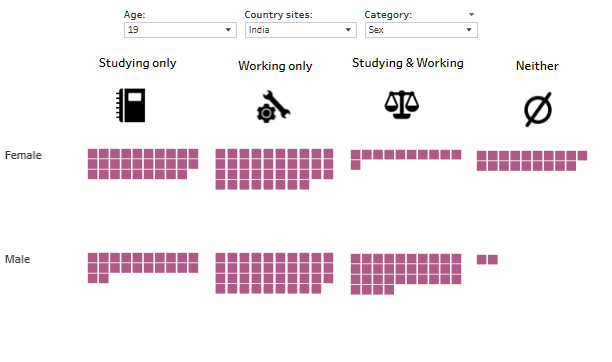 Finally, only 3-4 out of 10 young workers received social security in Ethiopia and Peru, and 2 out of 10 in India. Vietnam is the exception, given the strict regulation and the role played by the public owned enterprises, with about 6 out of 10 workers having a written contract and an equal proportion is entitled to receive social security benefits. This is a taste of what will be analysed in depth in the ‘Transition to the labour market and higher education: Evidence from the Young Lives study’ report coming soon. In this report we will discuss the challenges and strategies adopted by young people when transitioning from education to the labour market, analysing their educational trajectories and characterising the young labour market. So too we will explore to what extent growing up in economically poor households constrains education and working opportunities, the activity and type of work of young people, the job aspirations of children and their realisation or otherwise, and the types of skills young people have working in different activities. For updates, follow #YLLabourMarket on Twitter @yloxford.